Matthew Lyons of Tribute Pizza. Today, March 14th, is the debut of Tribute Pizza. This one-man-show, operated by Matthew Lyons, is debuting pop-up style inside of Coffee & Tea Collective at 2911 El Cajon Boulevard. Matthew was formerly the general manager of the MIHO food truck and is now focusing on Tribute Pizza and taking it from the current ‘project’ status to a full-fledged restaurant. Matthew has over 10 years of experience in the pizza-making world. As part of the first class at UC-Merced, he nearly launched a pizzeria there to capitalize on the newly-created college town demand but was dissuaded from this idea when he saw a headline naming Merced the “Foreclosure Capital of the USA”. Now in San Diego he’s working to move his plan for a pizzeria forward. The menu for Tribute is small and simple. Four choices of pizzas and a tiramisu made with local espresso and rum from Coffee & Tea Collective and Ballast Point, respectively. The pizzas range from $9 to $14 and for each pizza sold $1 is donated to a different charity, as indicated on the menu. I haven’t had a chance to sample the wares yet, since I came across Tribute this morning while on a coffee stop, but plan to head there tonight or in the next week to sample Matthew’s wares. Coffee & Tea Collective has excellent beverages (discussed in detail in this post from Omar Passons) and if they are allowing Tribute to share their space that’s an implicit recommendation I’m happy to take. Tribute Pizzeria is currently in ‘pop-up’ mode and was only at Coffee & Tea Collective for the debut day. 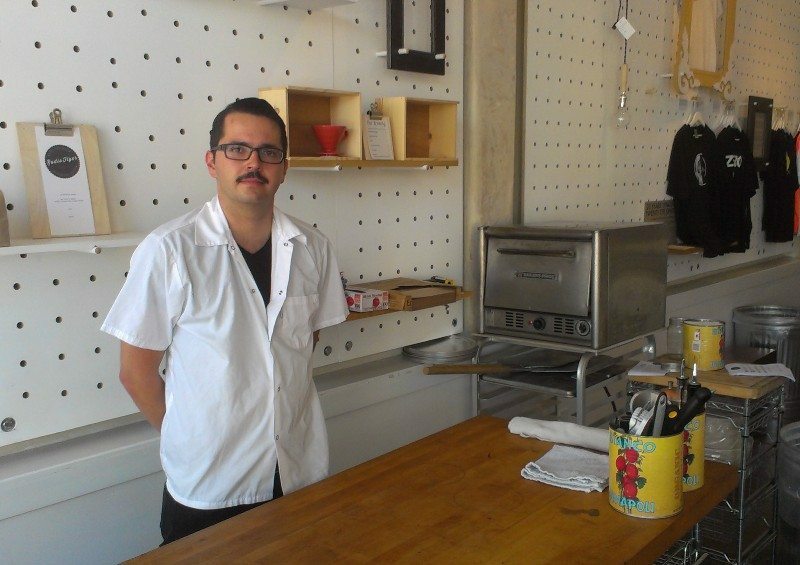 Matthew and his magical pizza oven will be popping up in other spots around North Park and San Diego in the future so keep an eye out for them. For more information check out tributepizza.com or Twitter (@tributepizza).